For the mundu tree, see Garcinia dulcis. For the ethnic group in Sudan, see Mundu people. Men wearing Mundu, some full-length, one tucked into the waist. 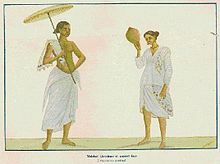 Nasranis or Syrian Christians of Kerala wearing mundu (from an old painting). Photo published in the Cochin Government Royal War Efforts Souvenir in 1938. The mundu (Malayalam: മുണ്ട്; pronounced [muɳɖɨ]) is a garment worn around the waist in Kerala, the Tulunadu region, and the Maldive Islands. It is closely related to the dhoti, sarong, and lungi. In South Kanara, a district of Karnataka state, the Tulu speaking folk and Beary community also wear the mundu. It is normally woven in cotton and coloured white or cream. The colour is dependent on whether the cotton is bleached or unbleached. A khaddar mundu is made using handlooms. When unbleached, the mundu is called "neriyathu". In modern times, two types of mundu are prevalent—the single and the double. A single mundu is draped once around the waist, while the double is folded in half before draping. A mundu is usually starched before use. A mundu usually has a line of comparatively thicker cloth woven into it near the border called the kara. The kara can be coloured and comes in various sizes. There is also double coloured and ornamental kara (a strip of colour at the end of the mundu). & Costumes Of Kerala. For more ceremonial occasions (like weddings), a mundu has a golden embroidery known as kasavu. The wearer highlights the 'kara' by carefully folding the end of the mundu. The kara generally appears on the right-hand side of the person, though styles with the kara on the left side are prevalent. Unspoken rules of etiquette govern the way the mundu is worn. Men will often fold the garment in half to resemble a short skirt when working, cycling, etc., but it is considered disrespectful to speak to women or one's social superiors with the mundu folded up this way, revealing the legs from the knee down. When faced with such a social situation, the fold of the mundu is loosened with an imperceptible flick and it flutters down to cover the legs completely. Sometimes a belt will be used; a popular Velcro belt that comes in either green or black has yellow pockets to keep valuables and hold the mundu (or lungi) secure. The 'melmundu' is an upper garment similar to the '[neriyathu]' that is worn by women; 'mundu' and 'melmundu' are part of the traditional Malayali costume worn by men. Despite considerable influence of western dressing forms in South Indian culture, Hindu traditional ceremonies of Kerala (some Hindu castes in other south Indian states) it is mandatory for the men to wear the Mundu. For Hindu Marriages Men has to wear Mundu along with either shirt or a 'Mel Mundu'. It is also considered appropriate for men to wear Mundu during their visits to the temples and attending religious functions, though it is not mandatory at all places. However, it is a mandatory requirement to wear mundu and Mel-mundu for men to visit some famous temples in Kerala like the Guruvayur Temple, the Padmanabhaswamy Temple) etc. For the convenience of the devotees, temple managements do provide these on rent bear the temple premises itself. A variant called a mundum-neriyathum is used more often by women. The mundum-neriyathum is a set of two mundus, both having matching kara. The set contains a lower garment similar to those worn by men. The upper mundu, worn with a blouse, is wrapped once around the waist and upper body and left hanging from the left shoulder, resembling a saree. This is often called a set-mundu. This is usually worn during festivals or special occasions. In Kerala a veshti is a small piece of cloth (generally put on the shoulders) along with a mundu, for formal occasions. In Kerala the Lungi, locally known as Kaili or Kalli Mundu, is worn by both men and women. It is considered a casual dress or working dress of labourers. Most men in Kerala use lungi as home dress or sleep dress. Lungis are generally colourful, and with varying designs. Lungis are not used during occasions such as weddings or other religious ceremonies. Saffron-coloured mundus are also known and kaavi mundu. Wikimedia Commons has media related to Mundu. The Syrian Christians of Kerala By S. G. Pothan.